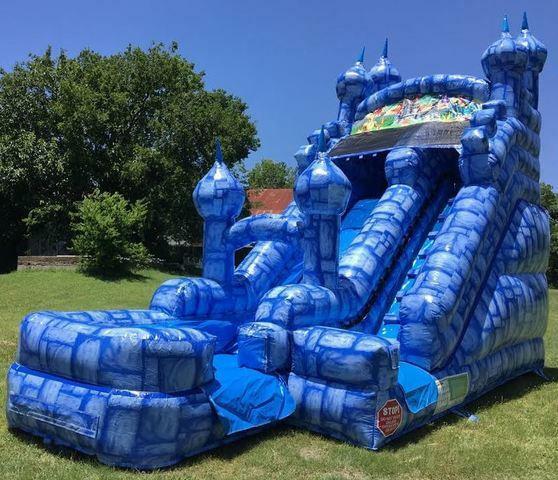 Austin Metro Moonwalks offers top quality inflatable water slide rentals, such as our 16' Blue Castle Water Slide. This waterslide rental is sure to make any party one to remember. Any bounce house and waterslide rental from Austin Metro Moonwalks will be the biggest attraction at your party. Its guaranteed to keep kids and even the adults entertained for hours. After every rental our waterslides are properly washed, inspected and sanitized to ensure that during your party your guest have a fun and safe time.